Every 2D Gaussian concentrates its mass at a particular point (a “bump”), with mass falling off steadily away from its peak. If we plot regions that have the *same* height on the bump (the same density under the PDF), it turns out they have a particular form: an ellipse. In this post, I’ll use math to show why it is an ellipse. Here’s an example of the kind of contour plot I’m talking about (note that this shows *many* 2D Gaussians all on one plot). The horizontal axis shows the first coordinate, , and the vertical axis shows . The contours illustrate values of that have the same probability under a particular Gaussian distribution, defined by parameters . 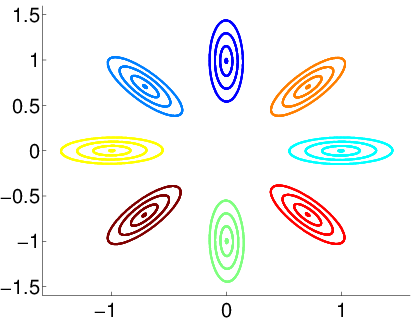 The position of the contours is governed by the mean parameter for each Gaussian. The goal of this post is to understand *why* this elliptical structure emerges no matter what covariance matrix we specify. To start, we’ll remind ourselves of the basic math behind the multivariate Gaussian. We are generating data , which is a -dimensional column vector. For the rest of this discussion, we’ll assume that , since we’re interested in plotting in just 2 dimensions. We are interested in finding a set of possible vectors such that *every* entry in has the same value . Furthermore, we want this set to be exhaustive, meaning no vector not in the set also has the PDF value . This set often called a level set of the function . Note that each choice of a particular constant defines a unique level set . This function is simpler to work with, so we prefer it to the original . The level set for given some constant will be equivalent to the level set for the original PDF given some transformed constant . It’s a nice exercise to find this transformation via algebra, but it’s not super relevant to this discussion so I’ll leave it to the reader. Our goal is to show that the level set of can be shown to have elliptical form. One immediate point to make is that the function is said to have “quadratic form“, and so does the standard elliptical form. So intuitively, we’re on the right track. Let’s proceed. If we can find a level set for this function, we can recover the level set for just by inverting our coordinate transform. The next step requires some knowledge of linear algebra, so we’ll make a brief aside to brush up. Earlier, we mentioned that the covariance matrix must be symmetric and positive definite. This property ensures that we can always *invert* the matrix (that is, exists, which is not true for all 2D matrices). But it carries other useful properties as well. So, we can write the inverse covariance matrix in terms of its eigen-decomposition. Remember that because of the orthonormal requirement, we know that (the identity matrix), and this means . This fact will be useful later. Note that this transform corresponds to a single 2D rotation of the coordinate system. Why? Recall that any matrix is a rotation matrix if it is orthogonal and has unit determinant (see here to review). We can show that satisfies both of these properties. (and hence ) is orthogonal by definition, because its column vectors are orthonormal. which implies . If , we have a valid rotation matrix. If , performs both rotation and reflection (e.g. flipping and in the output). Thus, the transform is a valid rotation (with a possible additional reflection). which can be written in elliptical form! where and . Note that it’s crucial that the eigenvectors are all positive for this analysis to hold. We have thus accomplished our goal. Given any arbitrary covariance matrix , the level sets of the probability density function of the Gaussian will have elliptical form.